Hi, this one’s for Karen M and Emily F, whom I shared them with. 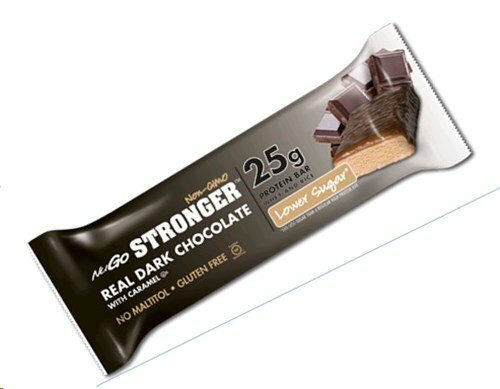 The one you ladies want is the Nugo Stronger Real Dark chocolate. As you can see, it’s a 5 star item on Amazon. I also asked them about placing it on Subscribe and Save as well. The Dark Chocolate is highly addictive, but I think for Peanut Butter and Chocolate, the gluten free P90X bars are better. As for a review: Well, I tried them and I went back and got more. They are VERY rich and chocolatey with only 9 grams of sugar, and no soy. No artificial sweeteners, no sugar alcohols. No rGBH. It’s 320 calories, but also an 80 gram bar. By comparison, the P90X bars linked below are 280 in a 65 gram bar, so bigger bar, more calories but it’s proportional to other bars. Get the P90X bars by clicking here.